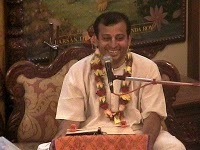 My dear Lord, You are the Absolute Truth, the Supreme Personality of Godhead, and You reveal Yourself to Your devotees. Besides Your Lordship, I do not see anyone who can actually explain perfect knowledge to me. Such a perfect teacher is not to be found even among the demigods in heaven. Indeed, all of the demigods, headed by Lord Brahma, are bewildered by Your illusory potency. They are conditioned souls who accept their own material bodies and bodily expansions to be the highest truth. All conditioned souls, from Lord Brahma down to the insignificant ant, are declared by Sri Uddhava to be covered by material bodies produced by the illusory potency of the Lord. The demigods in heaven, being absorbed in universal management, constantly utilize their fabulous material potencies. They therefore gradually fix their minds upon their mystically empowered bodies and also upon their bodily expansions such as their celestial wives, children, co-workers and friends. In the course of life in the heavenly planets, the demigods become conditioned to think in terms of material good and bad, and thus they accept the immediate welfare of their bodies to be the highest goal of life. The demigods do, however, try to strictly follow the laws of God. And to help them do this, the Supreme Lord descends to remind the heavenly beings of His own supreme personality, which possesses powers infinitely exceeding theirs. Lord Visnu has an eternal body, full of bliss, knowledge and unlimited variegated potencies, whereas the demigods possess only deluxe material forms, subject to birth, death, old age and disease. Because the demigods are attached to ruling the created universe, their devotion to God is tinged with material desires. They are therefore attracted to those portions of Vedic knowledge that award the various material opulences necessary for perpetuating their celestial life. Sri Uddhava, however, being a pure devotee of the Lord, is determined to go back home, back to Godhead, for eternal life and is thus not at all interested in the sophisticated Vedic knowledge of the demigods. The material world is a gigantic prison, whose inmates are subjected to birth, death, old age and illusion, and a pure devotee has no desire to remain there even as a first-class prisoner, like the demigods. Sri Uddhava desires to return to the kingdom of God and for this reason directly approaches the Personality of Godhead. The Lord is sva-drsah, or one who reveals Himself to His devotee. Thus, only the Lord Himself or His pure devotee, who faithfully repeats the Lord’s message, can take one beyond the material sky into the free atmosphere of the spiritual planets, where the liberated souls enjoy an eternal life of bliss and omniscience.